I’m running Mountain Lion on my MacBook Pro and using Pages. Since upgrading to Mountain Lion, Pages defaults to saving files to iCloud. I’d prefer that those files are saved to my Mac. Yet, even after choosing that option in the Save dialog box, the next time I save, iCloud appears again as the default location. Is there any way to convince Pages to always save files to my Mac? 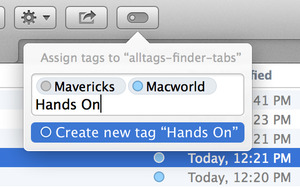 This switches the default save location for iCloud-compatible applications to the Mac. Should you wish to later change this behavior back to the default, simply substitute true for false in the command above. As for the new default location, when you save your next document, navigate to the folder where you’d like to always save your Pages documents and click Save. When you save subsequent Pages documents, this same folder should be the selected destination. Default Folder X provides ultimate control over save locations for any application. If you find that this doesn’t always work and you have $35 to devote to the problem, purchase a copy of St. Clair Software’s Default Folder X. Among the many things it can do, it allows you to assign default folders on a per-application basis. Or, if you prefer to save documents to specific folders based on the project you’re working on, you can assign keyboard shortcuts to those project folders. For example, Command-Option-F could be assigned to The Flanders Files. Just press that key combination while within a Save dialog box and you’re transported to that folder.